In this way, approximately one billion kilograms of polycarbonate is produced annually. Many other diols have been tested in place of bisphenol A, e.g. 1,1-bis(4-hydroxyphenyl)cyclohexane and dihydroxybenzophenone. The cyclohexane is used as a comonomer to suppress crystallisation tendency of the BPA-derived product. Tetrabromobisphenol A is used to enhance fire resistance. Tetramethylcyclobutanediol has been developed as a replacement for BPA. The second largest consumer of polycarbonates is the construction industry, e.g. for domelights, flat or curved glazing, andsound walls. A major application of polycarbonate is the production of Compact Discs, DVDs, and Blu-ray Discs. These discs are produced by injection molding polycarbonate into a mold cavity that has on one side a metal stamper containing a negative image of the disc data, while the other mold side is a mirrored surface. Typical products of sheet/film production include applications in advertisement (signs, displays, poster protection). In the automotive industry, injection-molded polycarbonate can produce very smooth surfaces that make it well-suited for sputter deposition or evaporation deposition of aluminium without the need for a base-coat. Decorative bezels and optical reflectors are commonly made of polycarbonate. Due to its low weight and high impact resistance, polycarbonate is the dominant material for making automotive headlamp lenses. However, automotive headlamps require outer surface coatings because of its low scratch resistance and susceptibility to ultra violet degradation (yellowing). The use of polycarbonate in automotive applications is limited to low stress applications. Stress from fasteners, plastic welding and molding render polycarbonate susceptible to stress corrosion cracking when it comes in contact with certain accelerants such as salt water and plastisol. It can be laminated to make bullet-proof "glass", although "bullet-resistant" is more accurate for the thinner windows, such as are used in bullet-resistant windows in automobiles. The thicker barriers of transparent plastic used in teller's windows and barriers in banks are also polycarbonate. Polycarbonate is commonly used in eye protection, as well as in other projectile-resistant viewing and lighting applications that would normally indicate the use of glass, but require much higher impact-resistance. Polycarbonate lenses also protect the eye from UV light. Many kinds of lenses are manufactured from polycarbonate, including automotive headlamp lenses, lighting lenses, sunglass/eyeglasslenses, swimming goggles and SCUBA masks, and safety glasses/goggles/visors including visors in sporting helmets/masks and police riot gear. Windscreens in small motorized vehicles are commonly made of polycarbonate, such as for motorcycles, ATVs, golf carts, and small planes and helicopters. Other miscellaneous items include durable, lightweight luggage, MP3/digital audio player cases, ocarinas, computer cases, riot shields, instrument panels, tealight candle containers and blender jars. Many toys and hobby items are made from polycarbonate parts, e.g. fins, gyro mounts, and flybar locks for use with radio-controlled helicopters. Standard Polycarbonate resins are not suitable for long term exposure to UV radiation. To overcome this the primary resin can have UV Stabilisers added. These grades are sold as UV Stabilised Polycarbonate to Injection Moulding and Extrusion companies. Other applications including Polycarbonate sheet may have the anti-UV layer added as a special coating or a coextrusion for enhanced weathering resistance. Polycarbonate is also used as a printing substrate for nameplate and other forms of industrial grade under printed products. The polycarbonate provides a barrier to wear, the elements, and fading. 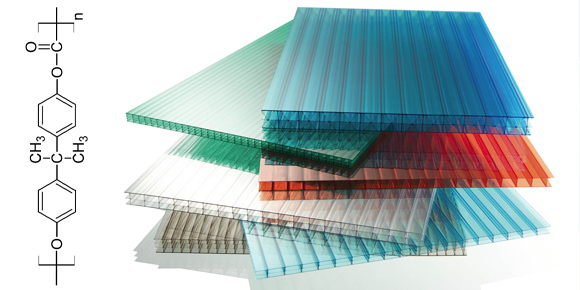 Many polycarbonate grades are used in medical applications and comply with both ISO 10993-1 and USP Class VI standards (occasionally referred to as PC-ISO). Class VI is the most stringent of the six USP ratings. These grades can be sterilized using steam at 120 °C, gamma radiation, or by the ethylene oxide (EtO) method. However, scientific research indicates possible problems with biocompatibility. Dow Chemical strictly limits all its plastics with regard to medical applications. Some major smartphone manufacturers use polycarbonate. Nokia has used polycarbonate in their phones starting with the N9's unibody case in 2011. This practice continues with various phones in the Lumia series. Samsung has started using polycarbonate with Galaxy S III's battery cover in 2012. This practice continues with various phones in the Galaxy series. Apple has started using polycarbonate withi Phone 5c's unibody case in 2013.